David and Goliath, by Anton Leinweber, ca. 1900. What Bible verse states that we should care for foreigners in our midst? he Philistines now mustered their army for battle and camped between Socoh in Judah and Azekah at Ephes-dammim. Saul countered by gathering his Israelite troops near the valley of Elah. So the Philistines and Israelites faced each other on opposite hills, with the valley between them. Then Goliath, a Philistine champion from Gath, came out of the Philistine ranks to face the forces of Israel. He was over nine feet tall! He wore a bronze helmet, and his bronze coat of mail weighed 125 pounds. He also wore bronze leg armor, and he carried a bronze javelin on his shoulder. The shaft of his spear was as heavy and thick as a weaver’s beam, tipped with an iron spearhead that weighed 15 pounds. His armor bearer walked ahead of him carrying a shield. Goliath stood and shouted a taunt across to the Israelites. “Why are you all coming out to fight?” he called. “I am the Philistine champion, but you are only the servants of Saul. Choose one man to come down here and fight me! If he kills me, then we will be your slaves. But if I kill him, you will be our slaves! 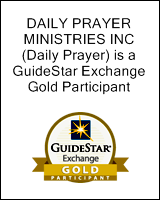 I defy the armies of Israel today! Send me a man who will fight me!” When Saul and the Israelites heard this, they were terrified and deeply shaken. 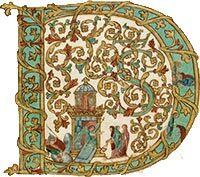 Now David was the [youngest] son of a man named Jesse, an Ephrathite from Bethlehem in the land of Judah. Jesse was an old man at that time . . . . David’s three oldest brothers stayed with Saul’s army, but David went back and forth so he could help his father with the sheep in Bethlehem. For forty days, every morning and evening, the Philistine champion strutted in front of the Israelite army. So David . . . arrived at the camp just as the Israelite army was leaving for the battlefield with shouts and battle cries. Soon the Israelite and Philistine forces stood facing each other, army against army. David left his things with the keeper of supplies and hurried out to the ranks to greet his brothers. As he was talking with them, Goliath, the Philistine champion from Gath, came out from the Philistine ranks. Then David heard him shout his usual taunt to the army of Israel. David asked the soldiers standing nearby, “What will a man get for killing this Philistine and ending his defiance of Israel?” And these men gave David the same reply. When David’s oldest brother, Eliab, heard David talking to the men, he was angry. “What are you doing around here anyway?” he demanded. “What about those few sheep you’re supposed to be taking care of? I know about your pride and deceit. You just want to see the battle!” [But] David’s question was reported to King Saul, and the king sent for him. 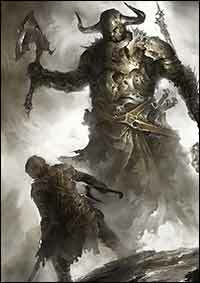 Goliath walked out toward David with his shield bearer ahead of him, sneering in contempt at this ruddy-faced boy. “Am I a dog,” he roared at David, “that you come at me with a stick?” And he cursed David by the names of his gods.“Come over here, and I’ll give your flesh to the birds and wild animals!” Goliath yelled. 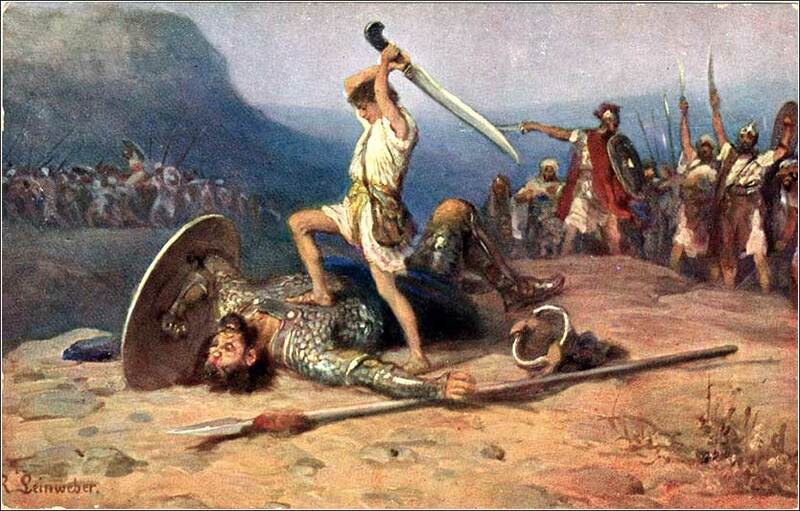 As Goliath moved closer to attack, David quickly ran out to meet him. Reaching into his shepherd’s bag and taking out a stone, he hurled it with his sling and hit the Philistine in the forehead. The stone sank in, and Goliath stumbled and fell face down on the ground. So David triumphed over the Philistine with only a sling and a stone, for he had no sword. 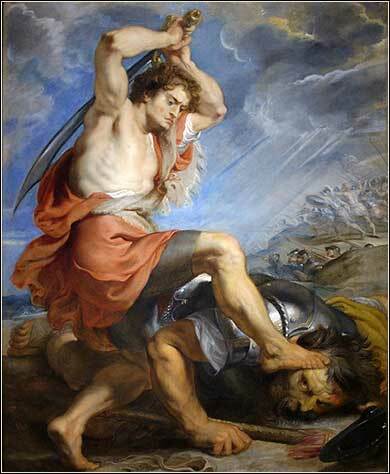 Then David ran over and pulled Goliath’s sword from its sheath. David used it to kill him and cut off his head. [And] when the Philistines saw that their champion was dead, they turned and ran. Everybody’s favorite Bible story, presented here in context. Note that David likens his battle with Goliath to protecting his father’s sheep.